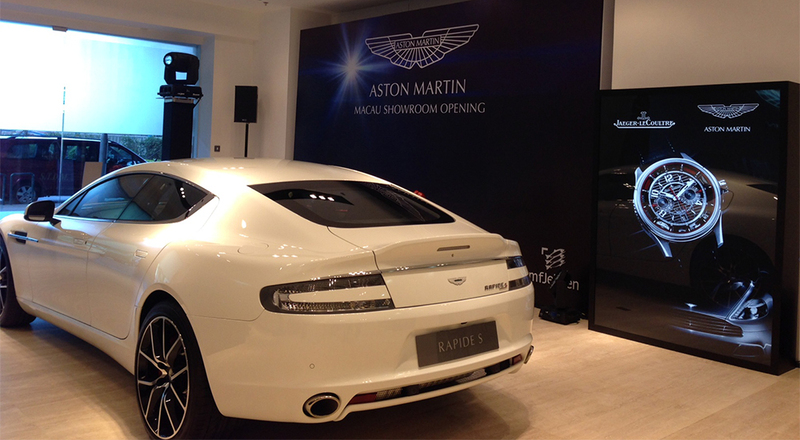 Macau, 24 February 2014 – Aston Martin is strengthening its presence in Macau with the launch of an exceptional new showroom in the glamorous South East Asian city. An official opening ceremony and celebration on February 20 saw Macau locals, socialites and officials from the city’s top casinos invited to view some of the luxury British sports car brand’s newest models – including the luxurious Rapide S and extreme V12 Vantage S – in the smart surroundings of the new showroom on Avenida 1 de Maio, R/C A, Bloco 4, The Bayview, Macau. Extending to 2,600 sq ft, the new facility features a well-appointed lounge equipped with Bang and Olufsen audio-visual equipment and a wide array of customised materials and parts for the discerning Aston Martin customer. The new showroom also captures the clean, sleek, and sophisticated look of Aston Martin, a style which is evident in the brand’s showrooms around the world. Spearheading operations for the new showroom is MF Jebsen Automotive Limited which has managed and operated Aston Martin Hong Kong for the last 11 years. The official launch evening was supported by Maria Plunkett, Aston Martin’s General Manager of Global Retail Network Development, who flew in from the UK to join the showroom opening. Other senior figures present included Markus Jebsen, Executive Chairman of MF Jebsen International; Gordon Choy, Aston Martin HK Managing Director; Clifford Wong, Deputy Group Managing Director MF Jebsen International; and Alvin Miu, Group Chief Operating Officer MF Jebsen International.